Would change our lives for-ever-ah? In our quest for Bentleys. By the rage they’re feeling. We make more money this way? You should see our 401-Ks! How can we sell out? This is how the game play—-dah. To us it just seems strange. What should we be Un-forgiven Forrrrrrrrr? Is surely not a sin. Just please don’t file share. Then you understand what we do. Yeah, you can understand what we do-ah! We are amused by youuuu-ah. And we’re The Un-forgiven Four. To hear us play The Unforgiven Five-ah. 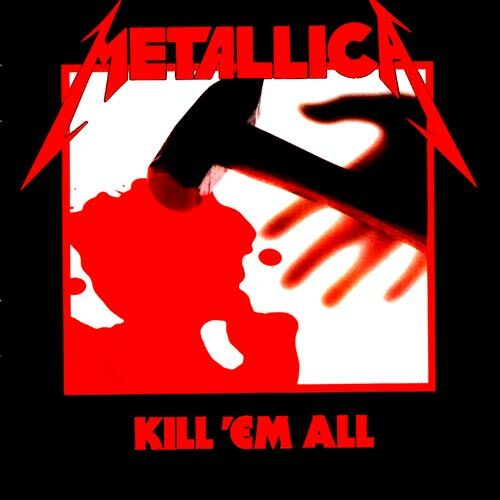 In 1988, Metallica released their seminal album “…And Justice For All”. 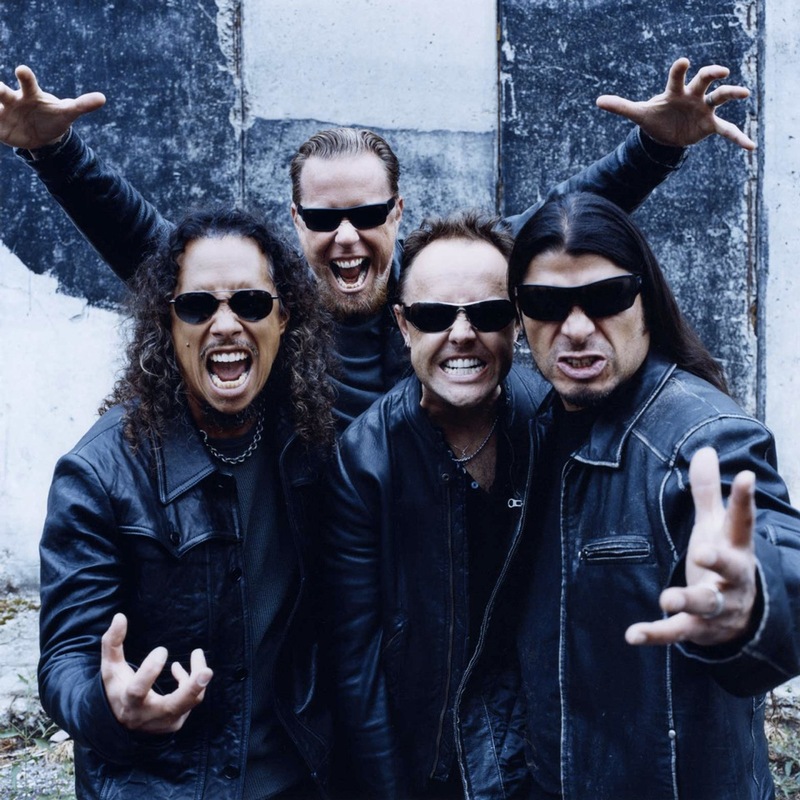 Beyond being one of the top selling metal albums of all-time it featured the debut of their new bassist Jason Newsted. Newsted took over for the late Cliff Burton who was considered one of the finest metal bass players on the planet. 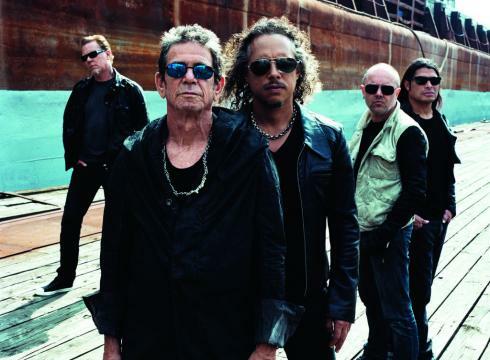 The band selected Newsted out of a pool of thousands of candidates including jazz legend Victor Wooten, Primus front man Les Claypool and Egyptian Prime Minister Hosni Mubarak. Newsted, who was never really considered much of musician, was selected for his very metal looking hair and menacing scowl. Following Cliff Burton was a challenge for a guy who only recently had learned to use both hands when playing the instrument. 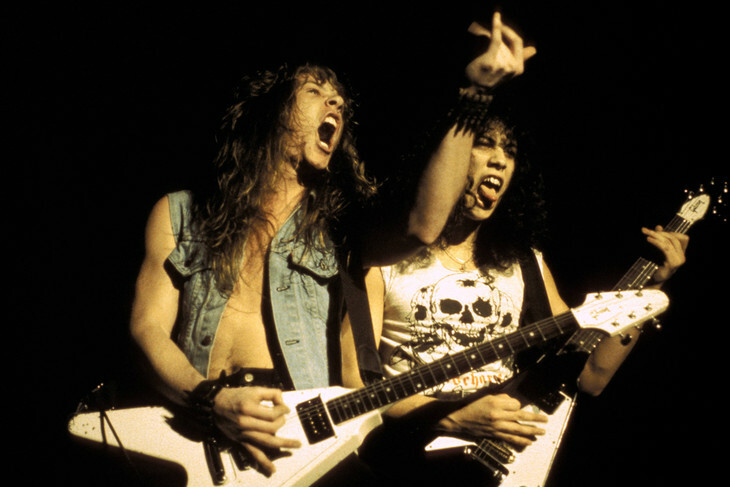 How would Jason replace this legendary metal figure? The invisible playing that Newsted performed on “…And Justice” is some of the most memorable non-playing in the history of the genre. Who could forget the fabulous non-bassline in Dyers’ Eve? Or the complex non-bass solo before the fade up at the beginning of Eye of The Beholder? By simply standing there pantomiming what an actual bass player would do, Jason helped create one of the most important albums in the last 30 years. Newsted abandoned the no-string bass on later albums. This proved to be a career-destroying mistake. James and Lars called a closed door meeting with Jason and broke the news to him. “I told him ‘Jason, we simply can’t grow as a band if you continue to insist on playing actual basslines. It’s just not your strength. Maybe it’s time for you to move on.’ Besides the “little Danish friend” talk with Dave Mustaine in the movie “Some Kind of Monster”, it was the most difficult conversation I’ve ever had,” said a teary-eyed Lars Ulrich as he casually glanced at his watch. 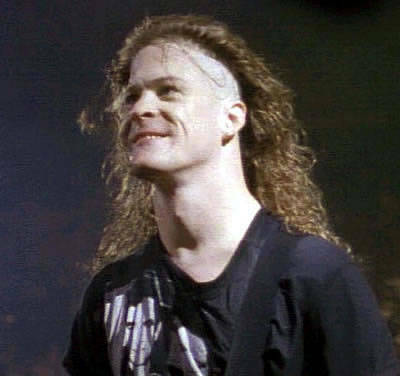 Newsted tried to bring back the “no string” style on a solo album called “The Sound of No Noise”. He was accompanied by two no string guitarists, a drummer with no sticks and a mute vocalist. The album sold less than 300 copies. 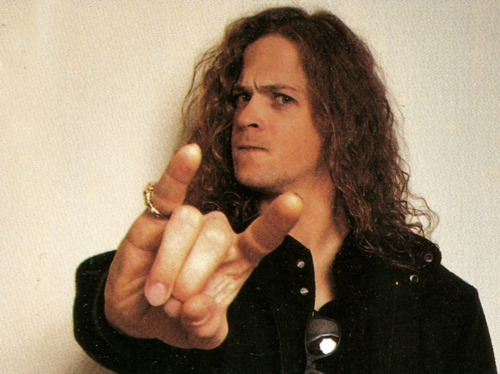 Newsted picked up studio work with several well-known bands, playing several times in the silent space between the last song on the album and the hidden track. What makes a man make puppets? The question has plagued me for the better part of my adult life. In my quest to find an answer I spoke with one of the great puppet makers of our age or any other, Darren “Geppetto” Moreash. Darren’s company, Darionettes, produces amazing puppet versions of metal artists. From James Hetfield to Slash, Darren has created remarkable likenesses of some of the most renowned figures in heavy music. How did you first become interested in puppetry? About 15 years ago I was going out with a girl who – for some reason – wanted a marionette, so, I went out looking for one. All I was able to find was some piece of crap thing (head was a wooden ball with a painted flat face) – just junk. That’s when I decided I was going to make one (of myself). I went to the library and got a book about puppets – do they still have libraries? Anyway I read up on them and carved one out (of myself). Not great but people she showed it too really liked it. I figured “Okay, if people like this one of me I’m going to get some proper tools and see about making some that I think are cool.” Shortly thereafter we broke up. I think she figured if she had a smaller version of me she didn’t need to deal with the big me. Anyway, I made a few, sold some, life got in the way and I stopped. Fast forward 5 years and I meet this girl at my work – tall, blond, 20 years younger than me – totally out of my league but I decide to make her one for Christmas. She’s a big Alice Cooper fan so that’s who I made and gave to her. She loves it – it’s still hanging in our house (10 years later). Yeah that’s right – she married me and since I’m not much to look at all I can say is “Power of the Puppet”, people, “Power of the Puppet”! She’s co-puppet maker with me, Julie makes the clothes and does most of the painting. 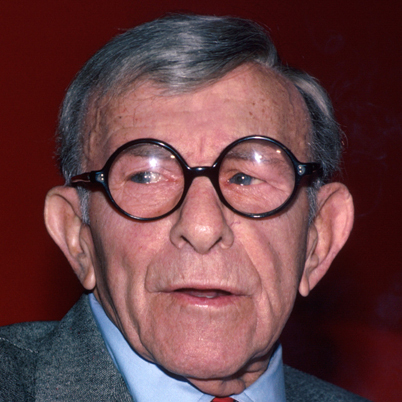 Why did you start making puppets of famous metal artists? I was on the net and was part of the ‘Anvil Metal Pounders Union’ or AMPU, the Anvil official fan club, and noticed that the band was really connected to their fan base. I figured that I’d make a couple marionettes of Lips and Robbo (Anvils front man and drummer). When I posted the photos, I got positive feedback and then noticed that Lips and Robbo themselves were commenting on the photos. I started thinking that I could keep these or see if they wanted them. I could always make more if I wanted (and did). Anyway, if I asked them if they wanted them and they responded “Hell Yeah!” To me, since I can make more, it’s cooler from my perspective to have pictures of the marionettes with the people I made them for or of. After having all the posters, albums and everything else these people have made that are hanging or on display in my home – its nice knowing there’s something in their homes that I made. After the Anvil thing, I just started contacting other people I have liked over the years and then try to get one to them and people really seemed to dig them. Which puppet do you believe is your best work? Okay, first I’ll give you the B.S. sounding ‘Gene Simmons talking about a new direction album’ answer. The one I’m working on now is my best work yet – by that I mean each one is artistically getting better than the last, ironically that happens to be a Gene Simmons one I’m working on now. My real favorite right now is either the one I did for Lemmy or Slash – Lemmy liked the puppet so much his crew said it was one of the top three fan gifts he’d ever gotten – the Slash one is for the reaction it evoked. 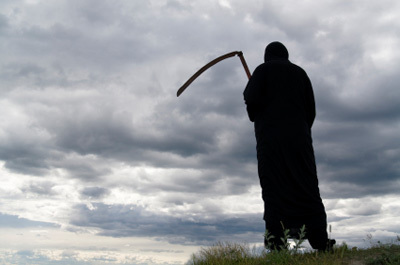 There are actually people who suffer from a rare disorder called pupaphobia (the fear of puppets). You recently had a run in with one such person. Can you give me some of the highlights? Oh yes, pupaphabia, a debilitating problem for some. 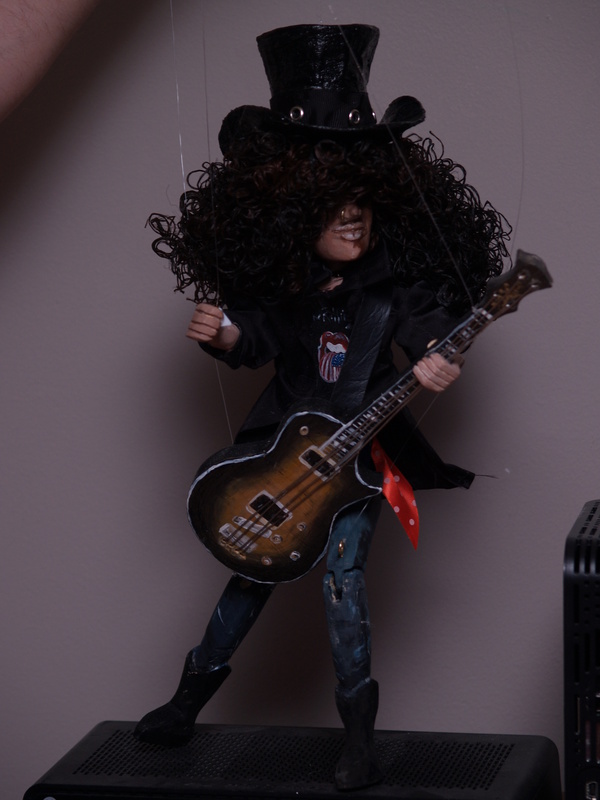 Last week a photographer friend of mine in TO was meeting Slash so he asked me to make a Slash marionette and he’d get it to him. He held it up and Slash stepped back – my friend asked him if he would hold it for a photo – to everyone’s surprise (including Slash’s road crew), Slash’s response was “Get that F@$king thing away from me – it’s freaking me out. I want no part of it.” Slash was visibly shaken up and although he signed a bunch of stuff for my friend, he would do so only if the puppet was nowhere near him. I knew nothing of pupaphobia until then, but have been reading quite a bit about it. The rumor (that I cannot confirm or deny) is that when at a very young age, he watched the T.V. movie “Trilogy of Terror” and, like most people of my age, was haunted by the Zulu Doll that terrorizes Karen Black. The difference being Slash never outgrew that image and it manifested into a phobia. Very sad and if I’d known I wouldn’t have sent it to him. Who are some of the other metal celebrities your work has gotten in the hands of? I’ve gotten them to many metal celebrities in various ways. I contacted Anvil through the social network Facebook, Cherie Currie of The Runaways as well. Metal photographers I’ve met have helped a great deal. Through Rockstarpix and Sister D, I’ve gotten them to Twisted Sister during one of her photo shoots. A friend of mine who plays Lemmy in a Mötorhead tribute band (Snaggletöoth) got one I made of Lemmy to Lemmy himself. I asked him how he was going to meet him and he said “I’m just going backstage” – now I gotta tell you – this guy is an ex-wrestler and when a 250 lb 7 foot ‘Lemmy’ tells you he’s going somewhere, it’s a safe bet that he is. A friend of a friend was seeing Metallica in Brazil and had a backstage access pass so I sent a James Hetfield and James loved it. A guy who runs the local rock station Q104.3 FM got an Ian Gillan one backstage when Deep Purple was in town and about a week later Ian emailed a photo to me of him and the marionette and a week after that he had posted a YouTube video about video piracy using the puppet in his place. It’s called “Garth on Piracy”. On the not-so-metal front, I’ve got one to Kevin Smith through the shows promoter and he brought it out onstage during his 200th “Smodcast” Podcast in Halifax, NS. Here’s an odd one: I’m sitting at home on Christmas Eve with “It’s A Wonderful Life” on T.V. and I get an email from Karolyn Wilkinson (she played Zuzu on IAWL, you know, “every time a bell rings an angel gets its wings!”) she was responding to an email I had sent a while prior and was messaging me on Christmas Eve to tell me that she would love to have a Zuzu marionette for the ‘It’s a Wonderful Life Museum’ in New York. You always hear the term puppetmaster used in a menacing way. Have you ever considered creating an army of demon puppets and bringing them to life in order to have them destroy the city of Calgary or anything like that? Do you have any demonical, puppet master type plans? If you want to see more of Darren’s work or contact him, check out Darrionettes.com or email him at darren_moreash@hotmail.com.